Just as I get all enthused about writing my blog again, I come down with a bout of flu on a par with the bubonic plague (without the dodgy armpit sores, thanks be…) (is it okay to talk about armpit sores on a food blog?). After six days in bed, and more time off work than is good for my bank balance, I’m downright desperate to be back to fiddle-like fitness. The worst thing about all this is the complete lack of interest I’ve had in food. I’m sure a lot of it is thanks to my tastebuds dying a death – when food becomes nothing but texture and consistency, well, Michel Roux could be standing over me with the finest coq au vin and it might as well be a Findus frozen lasagne. My friend Marian is one of my biggest fans. She’s always going on at me to enter The Great British Bake Off, or make her a cake, or set up my own cafe, or make her another cake. Now, as much as I (normally) like eating, I think baking a cake for someone else is right up there at the top of my list of pleasurable activities. 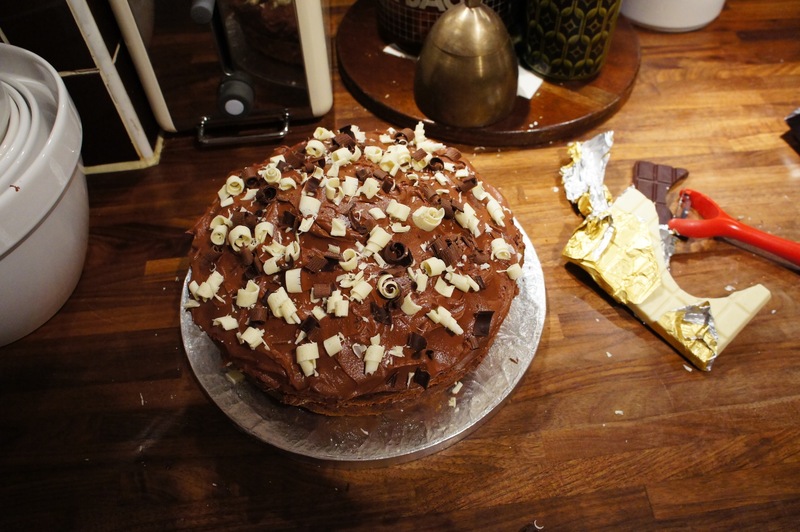 So when Marian asked me to make a birthday cake for her boyfriend a couple of weeks ago, I… actually, that’s a lie. She didn’t ask at all. I told her I was making it, and that was that. The boyfriend, I was informed, was a fan of carrot cake and chocolate cake. And, as I am most definitely not a fan of carrot cake (and what’s the point of making cake you can’t enjoy yourself), chocolate it was. 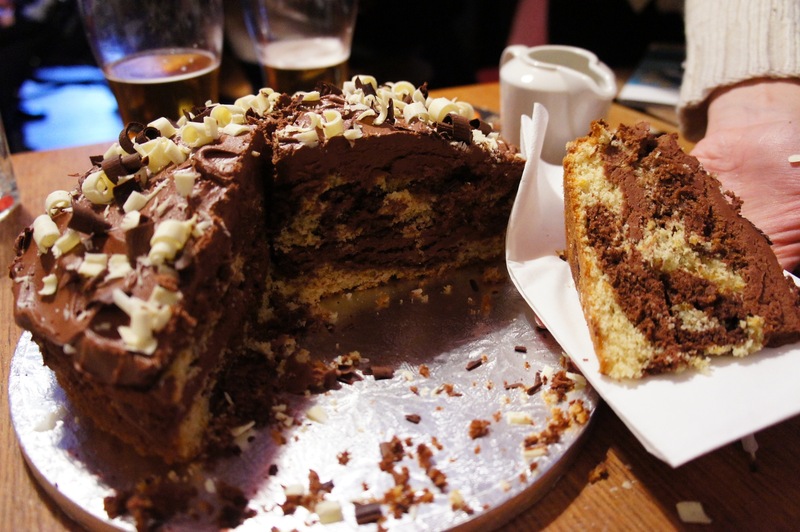 A few years ago, I made a chocolate and orange marble cake for Little Sis’s birthday that had both looked and tasted great. 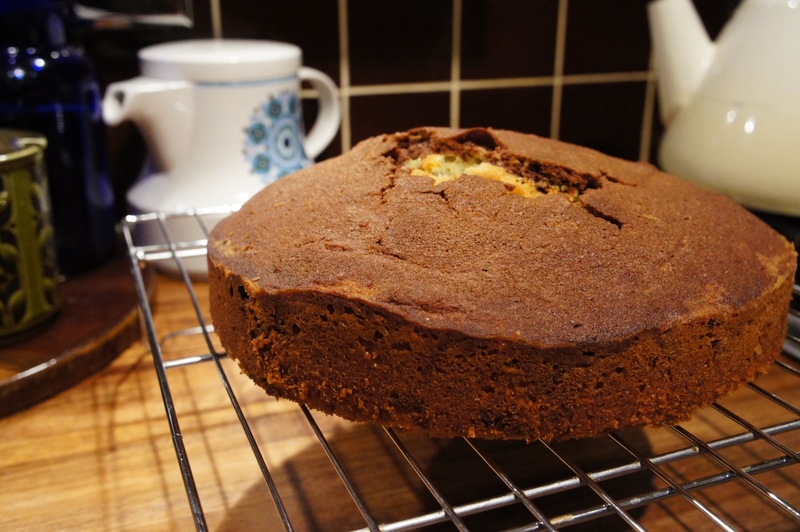 Cutting open the cake to see swirls of chocolatey and orangey sponge gives it quite a professional look – even though it’s actually really simple to make. 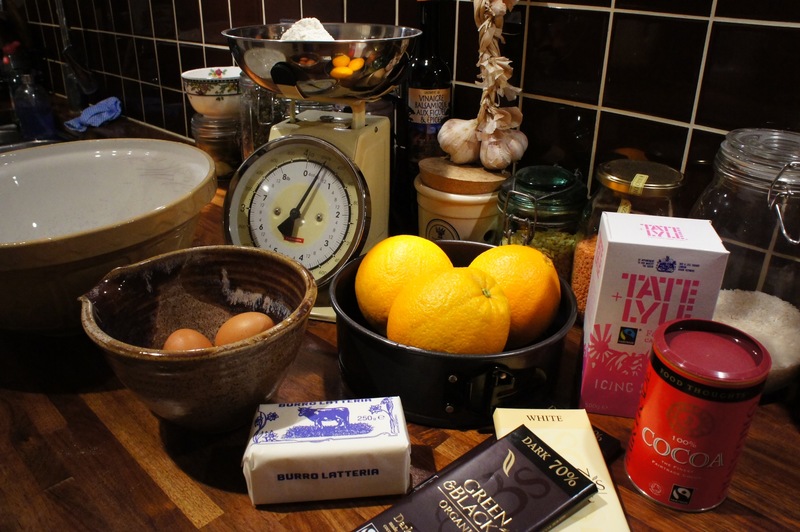 The recipe is from Leith’s Baking Bible, which is a must-have book for anyone who makes cakes regularly. All you do is make a traditional sponge batter, split the mixture in two, then add orange zest to one half and cocoa powder to the other. Then place alternate spoonfuls of the mixtures into your tin until it’s all in. 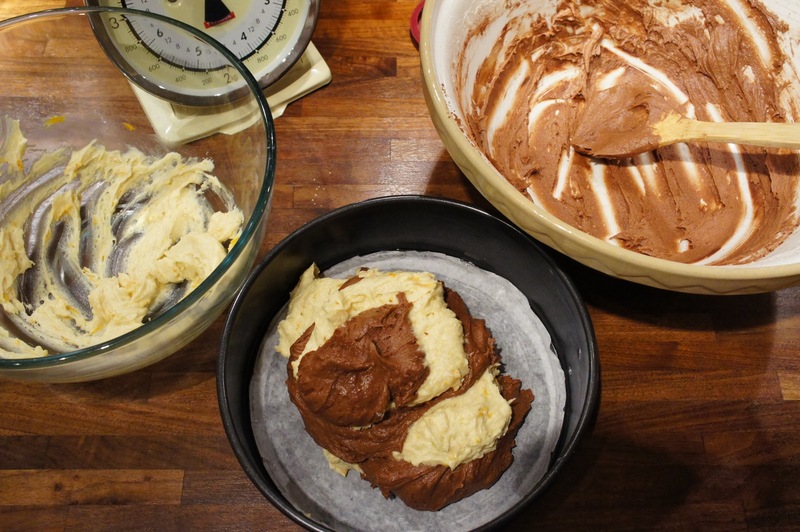 Roughly smooth the top, then get a clean knife and slowly draw a spiral from the centre of the batter outwards. Just the once. This will combine the two batters just enough to create a great marble effect once cooked. Cooking this cake, I came to the realisation once and for all that my oven is pretty damn efficient. Maybe a little too efficient. Hence the great crater in the top. Next time, I’ll remember to turn the temperature down a wee bit. But luckily for this cake, it was being iced, so I could disguise the slight amateurishness of its appearance. The Leith recipe also suggests sprinkling grated chocolate on top, which is okay, but I think random little chippy bits of chocolate doesn’t always look that great. I thought I’d attempt some proper curls for this one, and while researching the best way to do it, came across a fantastic tip. Instead of all that faff with melting the chocolate, pouring it onto a sheet, cooling, scraping etc etc etc – you do it with a vegetable peeler! The cake went down very well, although I’m not sure the boyfriend was too keen on half a Peckham pub singing him happy birthday in the middle of a Saturday afternoon. But hey, you want cake? You have to sing – or at least be sung to – for it. I think I just might try this. I’m no baker, but you have to start somewhere, right? Absolutely John, go for it! And the sense of achievement tastes almost as good as the cake itself. Thanks so much teamgloria. I did notice the Brighton connection – what a small world it is! And don’t you worry – the writing and baking will continue.